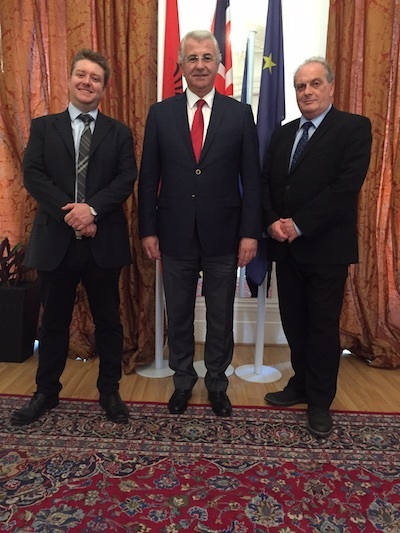 London – Mr. Riccardo Cacelli, CEO of Cacelli & Partners and Mr. Danilo Campestrin, CEO of Collins Dale Capital Partners met HE Qirjako Qirko, Ambassador of Albania to London. During the confidential meeting for possible foreign investments in Albania the topics of an economic and financial. In particular in luxury tourism, shipbuilding, engineering, telecommunications, High Tech, rail transport and football. “I’m very pleased met HE Qirjako Qirko – said Mr. Riccardo Cacelli – and to have deepened the knowledge of Albania and of some key sectors for a further economic development of that country“.